When I was down in Seattle with my mom this past December, I had the good fortune to visit a fabulous bookshop, the Seattle Mystery Bookshop! If you get the chance to visit I do recommend it! Full of fantastic finds and knowledgable staff, it was just lovely! I plan on getting lost in there again on my next visit. 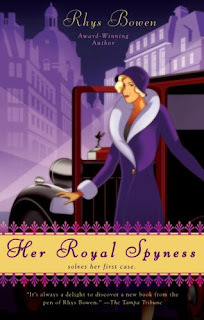 The best thing I took away from my visit was the complete (at the time) set of Rhys Bowen's Royal Spyness Mysteries. One of my favourite authors, Lauren Willig, recommended this series awhile back on her blog and it had been on my to read list for some time. Upon finding a complete autographed set of all 5 books (there has since been a 6th novel published) I knew we must be together and my lovely mom bought them for me as an early Christmas present. Hurray! Such a fun read for mystery and historical fiction fans! Bowen has created a wonderful character with Georgie and I really enjoyed reading all of her adventures. The latest novel is a holiday themed one (came out late 2012) and the next installment is due out August 2013. You can bet that I'll be getting my hands on both of them.